While home smoke alarms may all look very similar, there may be quite different in the way they work. Smoke alarm properly installed and maintained is the only thing in your home that can alert you and your family to a fire 24 hours a day and seven days a week. A working smoke alarm significantly increases your chances of surviving a deadly home fire. Install both ionization and photoelectric smoke alarms and dual sensor smoke alarms. which contain both ionization and photoelectric smoke sensors test batteries monthly. 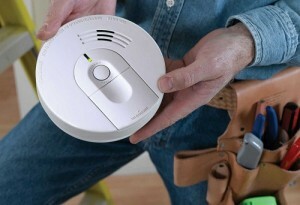 Replace batteries in battery-powered and hard-wired smoke alarms at least once a year. Install home smoke alarms on every level of your home, including the basement. Every country fire administration recommends installing smoke alarms both inside and outside of sleeping areas. Always follow the manufacturer’s installation instructions when installing home smoke alarms. Never disable a smoke alarm while cooking. It can be a deadly mistake. Open a window and door, button, wave a towel at the alarm to clear the air, or move the entire alarm several feet away from the location. Caregivers are encouraged to check the home smoke alarms of those who are unable to do it themselves. Smoke alarms with a vibrating pad or flashing light are available for the hearing impaired. Only contact your local fire department for information about obtaining a flashing or vibrating smoke alarm. Smoke alarms with a strobe light outside your home to catch the attention of neighbors and emergency call systems for summoning help are also available. Smoke alarm installation program in your family can make a measurable difference in reducing deaths and injuries from fire. Be the first to comment on "Home smoke alarms"